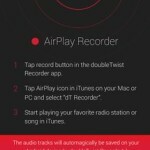 AirRecord: The AirPlay Recorder by doubleTwist records iTunes audio and radio to your phone or tablet using AirPlay! 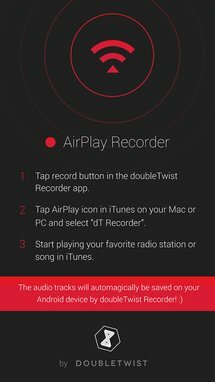 Brought to you by the creators of the popular AirSync and doubleTwist Music Player, the AirPlay Recorder saves songs and radio stations that you play from iTunes to your Android. It is extremely easy to use: play something in iTunes on your Mac or PC and then select “dT Recorder” from the AirPlay device list (http://support.apple.com/kb/HT5922). 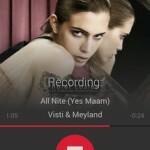 The streamed audio tracks will automatically be saved on your Android device. Due to the nature of AirPlay this is a real-time process: a 4 minute song will take 4 minutes to record. 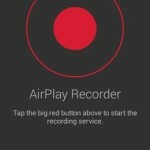 The AirPlay protocol is susceptible to packet loss and the app will only save a track if a complete recording was made. Make sure your Android device and router have good WiFi performance (5GHz band is recommended). 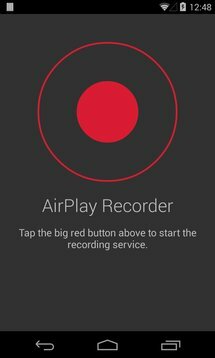 The basic app is free and there is an optional in-app premium upgrade to get higher quality recordings (AAC VBR). The money goes to feeding our cats free-range organic engineers. The app will keep your device’s screen on while recording to prevent the WiFi connection from being throttled or terminated when the screen goes off. We recommend that you keep your device connected to a power source while recording. doubleTwist apps are handmade with ❤ in San Francisco. iTunes and AirPlay are trademarks of Apple Inc.
♬ Reduced the likelihood of “missing start” error when WiFi signal is sub-optimal. ♬ Added a notification when WiFi connection is lost while recording service is running. 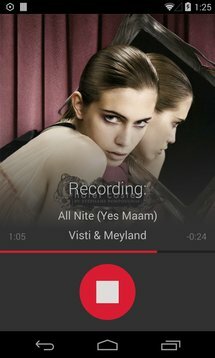 ♬ Added *experimental* support for recording AirPlay streams from the Music app on iOS.